VISITING CECAP IS A MUST FOR ANY GROUP INTERESTED IN LEARNING ABOUT LOCAL CULTURE, EDUCATION, AND DEVELOPMENT WHILE TRAVELING AROUND LAKE ATITLÁN. Explore a remote Mayan village and meet local men and women working with us to improve lives in the village. Meet students learning skills, including carpentry, culinary arts, and weaving, to better support themselves and their families. Schedule a group lunch at our rooftop restaurant and a cooking, weaving, or beading class to fully immerse yourself in Mayan traditions. Home to CECAP, Santa Cruz village is located on the shores of Lake Atitlan with stunning views of the surrounding volcanoes. The village itself is home to one of the oldest churches in Guatemala and is a tight-knit community of indigenous Kaq’chikel Mayans. Any tour of CECAP wouldn’t be complete without a stroll around Santa Cruz to get a sense of village life. 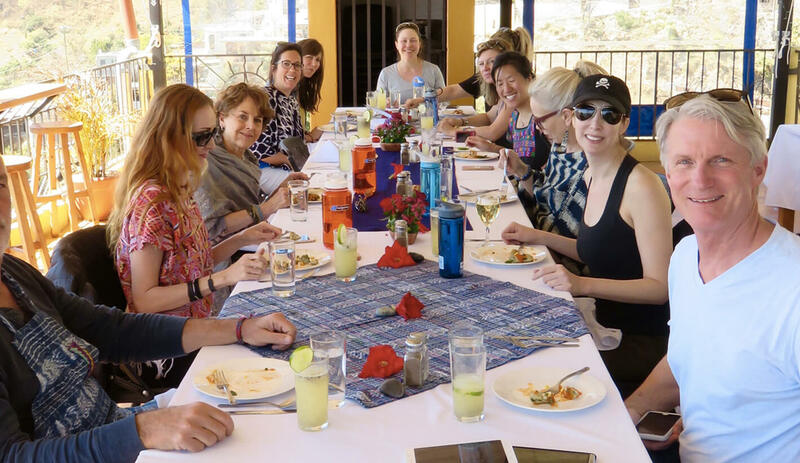 After touring CECAP, your group can have lunch at our rooftop Café Sabor Cruceño with breathtaking views of Lake Atitlán and enjoy food served by graduates of the CECAP Culinary Program. We offer a range of Guatemalan and Western favorites on tailor-made menus to suit your group’s needs. For an authentic Santa Cruz experience, your group can combine lunch in our restaurant with a cooking, beading or weaving class. Whether it’s learning how to cook a delicious pepian, weave a backstrap-loom scarf, or bead your own friendship bracelet, classes are a great way to meet local Mayans and understand their traditional crafts.